Please do visit Dr. Bipin Kumar if you are looking for a doctor who listens to you patiently, understands your painand treat you heartfully. Thank you!! Please do visit Dr. Bipin Kumar if you are looking for a doctor who listens to you patiently, understands your pain and treat you heartfully. Thank you!! 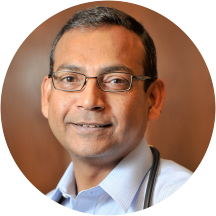 Dr. Bipin Kumar is a primary care doctor treating patients in Aurora, Colorado, and the surrounding communities. His primary goal as a practitioner is to ensure that each of his patients receives the highest available standard of medical care. He holds certification from the American Board of Family Medicine. Dr. Kumar also has more than 6 years of research experience and has been practicing medicine since 2007. Originally from India, Dr. Kumar attended the Rajendra Institute of Medical Sciences in Ranchi in order to pursue his medical degree. He continued his medical education at St. Vincent’s Healthcare. Here, he received his residency training in family medicine. Dr. Kumar keeps his practice up-to-date by attending conferences and seminars through the American Association of Family Physicians and the Colorado Academy of Family Physicians. Dr. Kumar provides general consultations, regular pediatric checkups, annual physical examinations, sleep studies, pulmonary function testing, and cardiovascular screening visits. Dr. Kumar don't provide chronic narcotic pain management.When he is not treating patients, Dr. Kumar enjoys hiking and spending time with his family. It was excellent! They listen! and are extremely professional. - I filled out all of the information here and then had to fill it out again when I got into the office anyway. - The doctor looked at me grossed out when I described my issue (I needed my earirrigated). - They then charged me extra (outside of my copay) without notifying me. I only had one thing done at the appointment, and was then billed for both an "office visit" and an additional service. The billing department then insisted this was standard practice when I had my insurance check with them. Go elsewhere. I was very pleased, I hope this medication works for me. I felt he was very helpful, he listened, and I'm very happy. Just had my first ever flu shot too! Very friendly and well explained the problem with right medication. Doctor is nice but the staff is harsh. Not friendly staff. He is a very good Doctor .He treated very well . I am really suggesting this doctor for your sickness. Dr. Kumar was great. He answered all my questions and got me in and out quickly like I needed. Vikki was extremely profession and helpful. She didn't make me feel rushed and made sure I had all of my questions answered before I left. Being new to the area, she made me feel welcome and I am excited to have found her to establish primary care!! I have high blood pressure, and needed to see the Dr. again to get my prescription refilled. He refused to prescribe me anything, going as far as trying to get me admitted to the ER. My blood pressure can be controlledwith medication. Now I can't get the much need medication I need. Everything was very streamlined, friendly, and well managed. The nurses were very friendly and excellent communicators, and Dr. Kumar's bedside manner was terrific. Quick & effective. All staff was nice. Booked an appt on Zocdoc the day of. Waited a little over 30 mins; that was little much, but being I gave them such short notice on the appt, it wasn't that big of a deal. Staff was mostly friendly. Nursewas firendly and caring. Dr. Kumar was very helpful and understanding of my situation. He asked a lot of questions, and made sure that I was either ok with what he was proposing or if I had any input he considered it. In the end, we left on the same page. And even though I waited a while, from nurse, to doctor, to leaving went fairly quickly, and I never felt rushed. Would recommend and planning on going back as needed. Today was a perfect example of what it is like being a patient of Dr. Kumar. I caught an upper respiratory infection over the weekend, got the ear ache, the sore throat and the cough. I had another appointment on thatside of town at 1:30 so I asked for a quick appointment. They booked me in 8 minutes for noon (perfect). The staff (in their typically human fashion) high-fived me after I got off the scale (knowing my progress on weight loss) and also congratulated me on on BP and O2. I was in the waiting room for less than 3 minutes and in the exam room for 1 minute after nurse exam and in popped Dr. Kumar. Efficient, fast, wise, and oh so humanistic; he assessed and prescribed what was needed. I had a full hour before my next appointment. I cannot recommend Dr Kumar and his outstanding staff highly enough. I was not pleased. He spoke To me like I was stupid. I would not recommend him to anybody. He's very rude. The office of Dr. Kumar is warm and efficient! Very clean, very thorough! Would recommend a hundred times! I have been with Dr. Kumar for couple of years i believe. And those couple of years, he has been an amazing doctor to me. He's very polite, nice, and helpful. I will definetly will recommend him to any of my family and friends. I like Dr. Kumar! He’s been my pcp for about 3 years now. I didn’t have any wait when I went in, I was seen in about 10 minutes. He’s a really good listener and pays attention to your details. Alsohe always offers additional health services like diabetes and cholesterol tests. I had waited over 1.25 hrs to see him. Not ok when you try and do lunch break doctor appts and need to get back to work. And it was just for a flu shot. I hope our next appt goesbetter. He did seem like a nice doctor though, just an off day I suppose. As my first visit Dr Bipin insisted on getting right the first time. I look forward to my follow up visit. Dr. Kumar had good bed side manner, explained everything well, and was very kind. Only concern was the wait was over an hour. Dr Bipin and his staff were awesome! I was uncomfortable going into the check up, however, they made me feel at ease almost instantly and were very informative. I would highly recommend Dr. Kumar and his office. Dr Kumar is very friendly and his clinic is very well maintained. My experience was very good once I reached at the clinic. But I faced some problem with scheduling appointment. I requested the appointment on Friday for Monday 12 Noon. But I got confirmation after 11:30 AM on Monday. One more problemis though they say that the clinic opens at 8 AM MST but actually it opens at 10 AM. Don't try to call them before 10 AM, no one will pick up the call. Dr Kumar is very knowledgeable and very patiently answers all your questions. He is never in a hurry. He knows his art well! My visit experience is really good. Swift, professional, caring. He does not treat anyone who has had an injury and needs help with recovery - he will not help you get better, just push you off to a specialist. Once the specialist goes away, he does not offer any long term care for your overall health. Other patients are happy. Good for them. Dr. Kumar was great and I could really tell that he was listening the entire time. He really takes your input into consideration and is happy to discuss concerns. Very Good Doctor. He Recommended for Vaccine shots. He also very Honest Doctor. He did Complete Physical test. One of the best doctor i have seen so far. Excellent staff and Dr. Fast and friendly. my new doctor is very kind and knowledgeable. I have picked a good one. Excellent doctor....effective treatment .....from now on he is gonna be my family doctor ...and recommend to others too. It was great. Friendly and profesional.